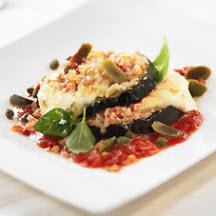 This excellent recipe for eggplant parmigiana was created by chef Sanford D’Amato. In small bowl, mix Asiago Cheese, bread crumbs and 2 tablespoons extra virgin olive oil; set aside. Using 3 tablespoons of the olive oil, brush eggplant slices on both sides; season with salt and pepper. Heat grill pan over medium-high heat. Grill each slice 3 minutes; turn and grill 2 minutes longer. Remove slices and cool. In large baking pan, spoon 8 tablespoons of tomato sauce in 8 circles. Place a slice of eggplant over each pool of sauce. Top with 1 slice Mozzarella, a basil leaf and another tablespoon of sauce. Repeat layers, using all ingredients and ending with all remaining tomato sauce. Sprinkle the cheese/crumb mixture over each eggplant stack. Drizzle remaining 3 tablespoons olive oil over all stacks. Bake 15 minutes or until hot and bubbly. Sprinkle capers and olives over each stack.